Dr. Jeremiah Burks has been an educator for more than 25 years. He received a Bachelor of Science degree from Delta State University. He later received a master's degree and specialist’s degree also from Delta State. He received his doctorate from Arkansas State University – Jonesboro in 2010. Before becoming assistant principal at SMS, Mr. Burks was assistant principal at Horn Lake High School. 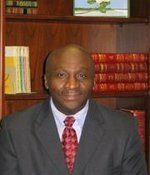 Dr. Burks served as a lead teacher, assistant principal, principal, and central office administrator in school districts in both Mississippi and Tennessee.